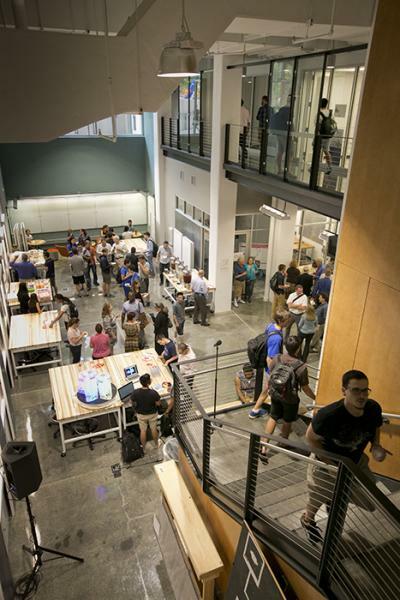 The Foundry is a 7,600-square-foot student-focused, project-centered, collaborative space where students from across Duke University can build ideas from the ground up. We serve student teams working on both long-term and short-term projects, as well as providing space for workshops and program modules. Foundry users have access to a variety of project and prototyping supplies, a light machine shop, dedicated project spaces and secure storage options. The Foundry enriches the Duke student experience by providing dedicated design and project space for co-curricular and entrepreneurial activities. The Foundry is part of the transformed Gross Hall on the West Campus of Duke University. The building, originally opened in 1968 to house chemistry laboratories, was extensively renovated starting in 2010 into a modern hub for public policy, big data, energy, and sustainability scholarship and entrepreneurship. The Foundry, which opened in 2015, is located in the lower level of Gross Hall. In keeping with its collaborative and team-based culture, The Foundry is advised and overseen by stakeholders from across campus that compose a Governing Committee, in close consultation with the community of Foundry Users. A manager and assistant manager guide day-to-day operations.